AirAsia Flight QZ 8501 Missing, 162 on board, likely to be on the seabed. AirAsia Flight QZ 8501 carrying 162 people on board was reported missing at 7:25AM local time on Sunday. 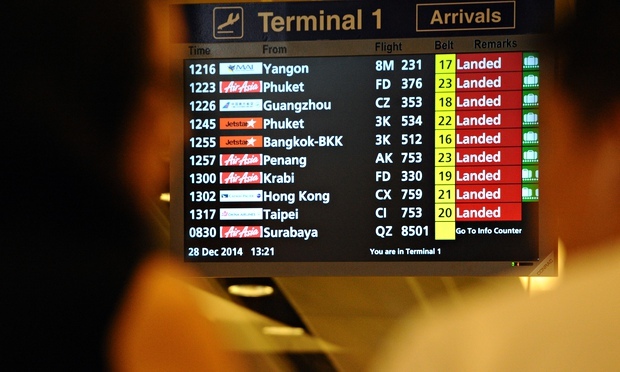 The flight had lost its contact with the Indonesian air traffic control. The flight was bound to Singapore from Surabaya in Indonesia. The pilot requested the communication center to deviate from the proposed flight route due to bad weather. Sources cite that the entire route of the flight, which went missing after 45 minutes take- off was above the Java Sea. The majority of the passengers were Indonesians. A British, A Malaysian, A Singaporean, three Koreans, 18 children and seven crew members were also on board. An AirAsia spokesperson said that search and rescue operations for the missing flight is being done under the supervision of the Indonesian Civil Aviation Authority currently. Reports also say that AirAsia Airbus A320 had circled over the sea near Belitung to avoid a storm before it experienced severe turbulence. AirAsia is a reputable aircraft company which is headed by Mr. Tony Fernandez a well-known figure in the aviation industry. It has a fleet of 160 – 170 Air bus 320. The Flight QZ 8501 is only six years old which is not at all old in the aviation industry. Airbus 320 is one of the safest, successful and liked flight by people all over the world. AirAsia has brought aviation cheaper to the common people in the Southeast Asia region, which is till now upholding their true values. Sources say that it is the middle of the monsoon season in these parts of the world. Satellites showed heavy rains and flooding throughout the borders of Malaysia and Thailand for the past 36 – 48 hours. North-eastern wind from the china seas bring Active thunderstorms and air turbulence are part of this region in this time which could be a possibility. This may be the reason that the captain requested for a deviation in the proposed flight route, but air turbulence may not only be the factor it could be human error too for the missing of the flight. The possibility of cloud cover, continuous rain, thunder and lightning could delay the efforts of recovery for of AirAsia flight for the rescue teams. If the Weather conditions are bad, search and rescue operations could be more difficult for recovery which could be delayed. Search and rescue operations are underway for the missing AirAsia flight QZ8501 from across the region from agencies. The official report from the Indonesian Civil Aviation Authority update about the missing Air Asia flight may be in a short while which has to be on the underway search and rescue operations in the region. The Malaysian government has offered a helping hand in search and rescue operation of Air Asia QZ8501 by sending three ships, C130 and the Malaysian navy to the Belitung area which will be co-ordinated with Indonesian search and rescue center. Emergency Number regarding the flight is available +622129850801. Previous: Gujarat Police comes up with Harley Davidson… Hope it will be implemented in all states. Next: Bangalore Horrified in grips of terror. Blast in church street. 1killed 2 injured.